platforms. AudioNow has more than 2,000 broadcast partners, including global leaders such as the United Nations, BBC, RFI, Voice of America, Entravision, C-SPAN and IMG College. In 2013 AudioNow delivered 2 billion listening minutes to its broadcast partners and connected users 84 million times to its platform. For more information about this report and AudioNow contact Natalie White at natalie.white@audionow.com and visit http://www.audionow.com. July 28, 2014 – AudioNow, – a call-to-listen mobile platform, – was created, in part, to connect diaspora communities to their countries of origin through radio programming, and could potentially serve as an effective research proxy into this increasingly influential marketplace. Currently, as of July 28, 2014, “the platform” (AudioNow) partners with more than 2,000 stations, and serves as a bridge for more than 1.5 million “unique” callers, who have consumed 2 billion listener minutes over the course of 84 million calls in 2013. Broadcast partners include industry leaders such as BBC, C—­‐SPAN, Voice of America, Al Jazeera, Entravision, and hundreds of in—­‐language broadcasters around the world. extraction; in-language telephone survey capabilities; as well as an established connection with station broadcasters, who possess unique insight and access into their respective communities. In November 2013, AudioNow partnered with the research firm Millennial Strategies LLC to study how the platform’s measurement capabilities can best be leveraged as a data-collection platform. The primary objective of this study is to develop a high quality, practical research foundation, as well as an appropriate methodology for future AudioNow measurement efforts. A top-line analysis of caller and station data showed that at least 84 distinct ethnic groups are represented amongst AudioNow callers. The reach of AudioNow into certain US ethnic markets, in fact, is significant. 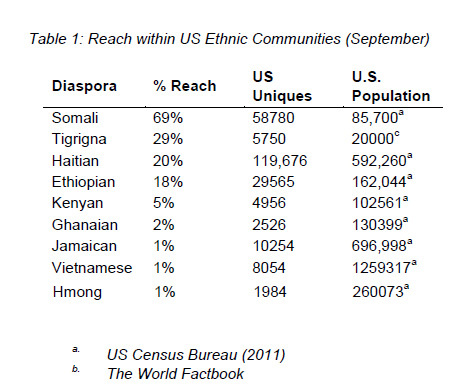 For example, when comparing the AudioNow population size of specific immigrant communities against US Census data, the platform reaches more than 69% of Somalis; 20% of Haitians; and 18% of the foreign-born Ethiopian populations in the continental US (Table 1). This study seeks to demonstrate the platform’s capabilities to probe deeper into the ethnic community. Specifically, it profiles AudioNow’s two largest ethnic groups, the Haitian and Somali diasporas, through an in-language telephone survey. The survey is designed to collect information about the diaspora’s demographics as well as remittance habits, as a means of demonstrating AudioNow’s unique reach and data collection capabilities. The results are presented below. translated into the native languages for both ethnic diasporas (French-Creole and Somali), and probed for key demographic information, as well as remittance habits.